The Assumption by Maria Von Trapp & “Queen of the Home” Apron Giveaway!! Posted by Leanevdp in by Maria Von Trapp, Give-Aways, Seasons, Feast Days, etc. The day of the Assumption, August 15th, is the oldest and most important of all the feast days of the Blessed Mother. In the old country it is also known as “Great Flower Day.” All the women and girls come to church on this day with their arms full of neat bundles of herbs, which they put down in the sanctuary at the Offertory procession. On this feast day the Church blesses the herbs immediately preceding Mass. The priest, standing before the altar and facing the people, pronounces a long and solemn blessing at the end of which the herbs are sprinkled with holy water and are incensed. There are special herbs which traditionally have to be included. Days before the feast the people are collecting them in the meadows and woods. Every family sends one such bundle to be blessed. Afterwards it will be kept in the corner at home near the picture or statue of the Blessed Mother. In cases of sickness a leaf is dropped into the food of the patient and during heavy thunderstorms one of the herbs is put into the fire on the kitchen stove–it is a sacramental and is meant to protect us in body and soul. The connection between the feast of the Assumption and the blessing of herbs is told in an old legend. When Mary the Mother of Jesus felt that her end was drawing near, she sent her guardian angel to summon the Apostles, who had gone out into the world to preach the Gospel of her Son, Our Lord Jesus Christ. When they received the summons, they came in a great hurry and were just in time to witness the happy death of their dear Mother. Everyone had come except Thomas. He was three days late. When he heard that the Blessed Mother had been resting in the tomb for days, he cried bitterly and pled with the Apostles to open the tomb once more and let him glance at the beloved features. The other Apostles yielded to his plea, but as they opened the tomb, they found it filled with flowers, which gave out a heavenly scent. On the place where they had laic the body there was only the shroud left–the body had been borne up to heaven by the angels, where it was joined by the holy soul of the Mother of God. According to the legend, all the flowers and herbs on earth had lost their scent after Adam and Eve committed the first sin in the Garden of Eden. On the day of the Assumption of the Blessed Mother, however, the flowers were given back their scent and the herbs their power to heal. To celebrate, let’s have a special Giveaway! Virginia (my daughter and the talented seamstress) and I would like to offer you today this beautiful, fully lined, hand-embroidered Queen of the Home “Roses in Blue” Apron!! It’s easy to sign up! Just leave a comment on this post and your name will be added to the hat! I will announce the winner on Tuesday, August 22! Subscribe to Finer Femininity and don’t miss a post! If you subscribe today, your name will be added twice for the Giveaway! A sermon for this wonderful feast day! Your children can celebrate with these coloring pages! Oh my! I LOVE these colors! I have been dreaming of owning one of these for awhile now, but haven’t been able to picture myself in the other color options. However, this…THIS I can! Wonderful job! Thank you so much for all you do! I haven’t heard of the story of Thomas and herbs/flowers! Thank you so much for sharing that with us. How lovely! I would love to win this. 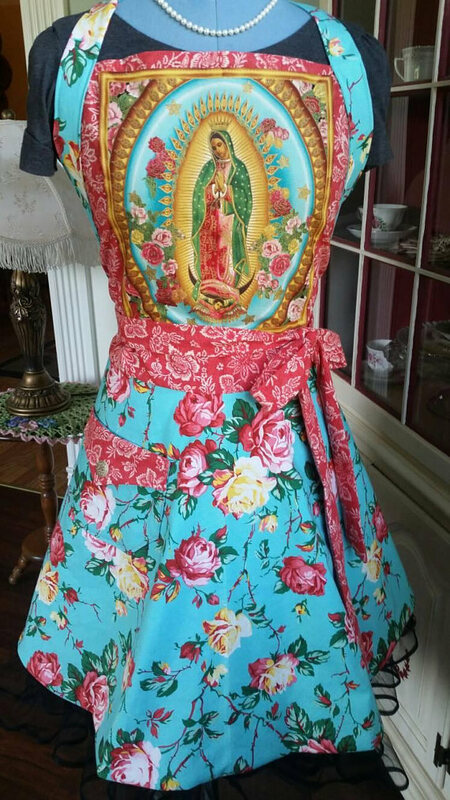 Beautiful apron. Such skill to have! What a beautiful tradition of blessing of herbs that I wish was still was alive! I would like to learn more about other traditions throughout the liturgical calender to share with my children. Thank you for all your wonderful postings! What lovely workmanship- I’m sure it’s even better irl. I gave my copy of “Around the Year” to our parish library- such a great reference. All of your aprons are so pretty. I would love to win this for my daughter who is getting married in October.